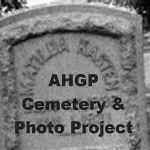 Welcome to the AHGP Cemetery Transcription and Photo Project. If you have a cemetery listing on the web that you would like to link, would like to transcribe a cemetery or do lookups, please email the project with the following information. If you have any comments or questions, contact Cindy Koegel, AHGP Cemetery Transcription and Photo Project Coordinator. Copyright 2001 - 2009 by AHGP Cemetery Transcription and Photo Project. This nonprofit research network is affiliated with the American History and Genealogy Project (AHGP). It is hosted by USGenNet, a nonprofit historical and genealogical Safe-Site Server. No claim is made to the copyrights of individual submitters, and this site complies fully with with USGenNet's Nonprofit Conditions of Use.